A project of Czech-Inspired Music on two continents. October, 2004. In the fall of 2004, a month-long series of concerts celebrated the centennial of Antonin Dvorak’s death. 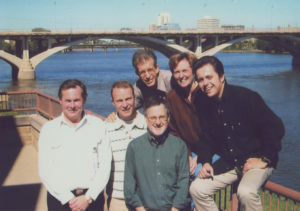 Conceived by Red Cedar Chamber music directors/artists Jan Boland and John Dowdall, the project covered two countries (the USA and The Czech Republic), five cities (New York, Washington D.C., Cedar Rapids, Prague and Brno), and three small Iowa towns (Spillville, Ainsworth and Marion). Why do we call this project From Starched Shirt Cuffs? Because Antonin Dvorak had a habit of going for long morning walks along the Turkey River in Spillville, Iowa in the summer of 1893. When inspired by musical ideas, he found himself frequently without his notebook. So he simply penned his musical ideas on his starched shirt fronts or shirt cuffs. This account comes from the diary of his laundry lady, left with the task of washing out the ink! This project was three years in the making. Throw into the mix The Red Cedar Trio, members of the Prague-based Quartetto Telemann, fifteen Iowa composers, Spillville, Iowa, and the centennial celebration of Antonin Dvorak — and From Starched Shirt Cuffs was born! The centerpiece of the project is the commission and premiere of Spillville Variations on a Theme by Dvorak,a collaborative commission by 15 Iowa composers. That large group commission is described just below. The work was premiered in 2004, but was played many times throughout the next 15 years and beyond. Some of the variations can be heard on youtube. Spillville Variations on a Theme by Dvorak was the centerpiece of the project. The composers, all Iowans or with strong Iowa connections each wrote a one-minute variation on a musical theme by Antonin Dvorak. Why Dvorak? Antonin Dvorak lived and worked in Spillville, Iowa for three months in 1893. The first work he created in Iowa was his famous American Quartet. Red Cedar’s flutist, Jan Boland, selected the music from the opening one minute of his Scherzo movement of the Quartet as the subject of this composition; she arranged the one-minute selection for flute, viola and guitar. Then John Dowdall (Red Cedar’s Artistic Director and guitarist) and Jan Boland (Executive Director and flutist) selected professional composers with strong Iowa connections to each write a one-minute variation. In partnership with the Iowa Composer’s Forum, a student competition was held. Wouldn’t it be a potentially life-altering experience for a composer (under the age of 18) to be invited to participate as a composer in this project and have his/her work performed and recorded alongside that of professional composers? The competition yielded not one, but two talented young musicians who were both invited to participate (Gullickson and Gilbertson, listed below). In 2009, two additional Iowa composers were invited to add more brief variations to the project. Andrew Earle Simpson wrote “Joyful, Steady Grove” and Joshua Reznicow wrote “American Sketch”. 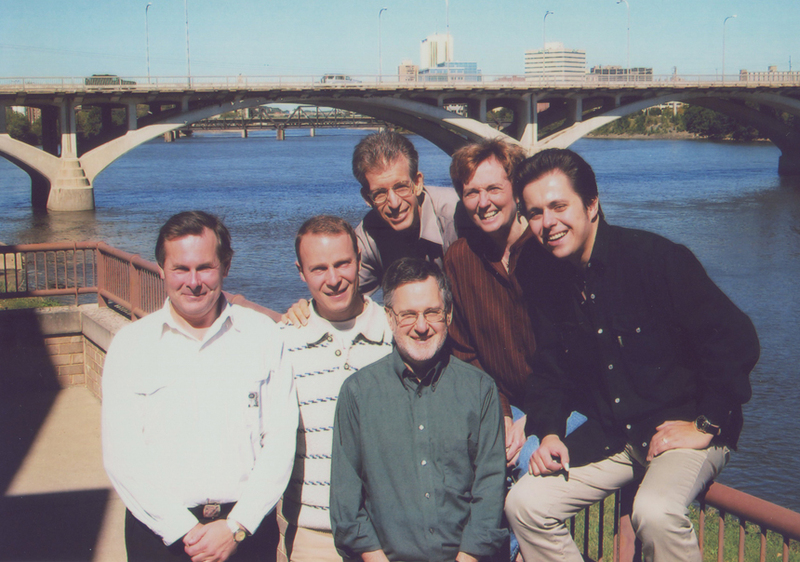 In 2010, the complete set of variations was featured on National Public Radio on a program called Classical Guitar Alive. Red Cedar Chamber Music was invited to perform the work at the convention of the National Flute Association in Nashville in 2004. Sponsors: Lead sponsors are GreatAmerica Leasing, CRST International, the Iowa Department of Cultural Affairs, Victor & Max Naxera, William Whipple, and the National Endowment for the Arts. Strong partnerships with Prague-based National Museum, the Iowa-based National Czech & Slovak Museum & Library, the American Embassy of the Czech Republic, and Red Cedar Chamber Music made this project a success. Variations on a Theme by Dvorak was recorded in 2005 on a compact disc titled Czech-Inspired and released by Fleur-de-Son Classics. Recording artists are Jan Boland, flute; David Miller, viola: and John Dowdall, guitar. Recording engineer/editor is Peter Nothnagle. A musical score of Spillville Variations on a Theme by Dvorak was published by ALRY Publications in 2017. Published parts are for flute, guitar and viola. Ten of the variations have an alternate part for the cello. There were a myriad of educational events surrounding this series of concerts, plus two Rural Outreach concerts. For example, the concert was taken to Spillville, IA — where Dvorak lived and composed in the summer of 1893 — for a Rural Outreach concert in the beautiful Czech church where Dvorak himself played the organ. The schedule is below. • September 16, 2004: Learn at Lunch series at the National Czech & Slovak Museum & Library (free). • September 16 Four Oaks Bridge after-school program. • September 22: Czech Village at Sykora Bakery. Cedar Rapids, IA. • September 22: Cedar Rapids Library,Cedar Rapids, IA. • September 23: Coolidge Elementary School, Cedar Rapids, IA. • September 30: Ainsworth Opera House, Ainsworth, IA. • October 1: St. Wenceslaus Church, Spillville, Iowa. • October 2; MainStage concert at the National Czech & Slovak Museum & Library, Cedar Rapids, IA. • October 3: Main Stage#2. From Starched Shirt Cuffs: Dvorak in Iowa. Concert Series main event at the National Czech & Slovak Museum & Library, Cedar Rapids, IA. • October 4: Catholic University, Washington D.C. With composer Andrew Simpson. • October 5: Concert at the Czech Embassy in Washington D.C.
• October 7: Hunter College, New York. Sponsored by the Czech Center of New York. 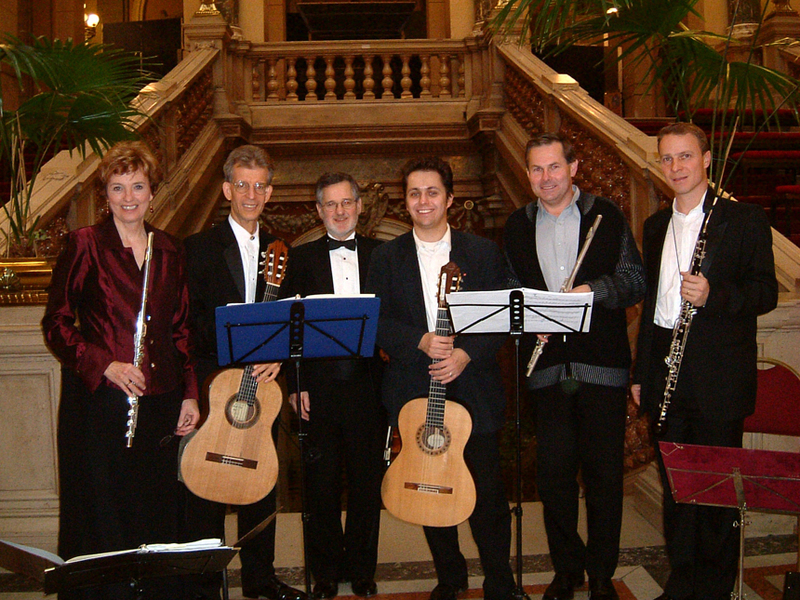 • October 12: Concert “On the Steps” series at the National Museum in Prague, The Czech Republic. • October 14: The Janacek Academy of Music and Theater, Brno, The Czech Republic. Jan Boland is flutist and Executive Director of Red Cedar Chamber Music. Her scholarly works and editions are published by University of California Press/Berkeley, Indiana University Press, ALRY Publications and Falls House Press. She records exclusively for Fleur de Son Classics. Her doctorate is from the University of Iowa. Jonathan Chenette teaches composition at Grinnell College in Iowa. His compositions have appeared on the ISCM World Music Days in Amsterdam and on a national radio broadcast by the St. Paul Chamber Orchestra. Several of his scores are published by Boosey & Hawkes and Theodore Presser. Statement: Jonathan Chenette’s variation reweaves elements of the theme in a spirit of whimsy and free exploration. The innocent guitar figure from the final measure of the theme becomes the flute’s main idea, and the composer heightens some of the modal and rhythmic quirks while retaining the form and most of the ideas from Dvorak’s original. Peter Hamlin has been a radio feature reporter in San Diego, a classical music radio host/producer and television host in Iowa, and a professor of composition, theory and electronic music at St. Olaf College in Minnesota. He has written a wide variety of music for orchestra, band, chamber ensembles, choir, and solo voice, and he has also written numerous works for young audiences, an opera, and computer music. He received his Ph.D. in composition from the Eastman School of Music, where he studied with Joseph Schwantner and Samuel Adler, and he received his M.M. in composition at the University of Northern Iowa studying with Peter Michaelides. Statement: My variation is made up almost entirely of canons, passages in which a melody is repeated several times in sequence (such as in the familiar round “Row, Row, Row Your Boat”). I got the idea from a wonderful repetitive section in the theme and found that other ideas in the piece can be treated canonically as well. Robert Lindsey Nassif was named winner of the Richard Rodgers, AT&T, & Music Publishers Assoc. Awards. His Broadway and Off-Broadway scores include Hollywood Arms by Carol Burnett and Opal. He composed scores for Eliot Ness in Cleveland and Flight of the Lawnchair Man, and dance music for Sondheim’s musical Bounceperformed at the Kennedy Center. Statement: Dvorak came to Iowa to find peace. Instead, he found inspiration, or perhaps inspiration found him. In the stillness and solitude of the countryside, Dvorak heard new music. My variation is a freeform fantasy in minor mode based on an brief but obsessive and insistent musical figure from his string quartet. Michael Gilbertson began studying piano at age 5 with his mother. Now a 10th grader in Dubuque, Iowa, he is a pianist, violinist, violist and composer. His music has been premiered and commissioned by ensembles such as the Dubuque Symphony Orchestra, The JuBELLation Ringers, The Cleveland Institute of Music, and the Dubuque Chorale. His was named First Place Winner in the Iowa Composers Forum Student Competition. In 2003, Michael was invited to attend a week of study at the Cleveland Institute of Music. Michael studies composition with Tracey Rush. Statement: This variation utilizes a motive from a previous work. This motive, combined with the theme’s relationship of pitches rather than rhythm, is the basis for this variation. Woodwind specialist Lyle Dockendorff has lived, taught and performed in Arizona and Alaska. He now resides in Portland, Oregon. Maintaining an active woodwind studio and composing/arranging/performing as bassoonist with the woodwind ensemble Trio Trachee. Statement: I pictured Dvorak on a leisurely walk and imagined what he may have heard as a variation on his own theme. Tracey Rush is founder and Executive Director of the Northeast Iowa School of Music in Dubuque, Iowa. She has received over 20 commissions. Her “Angels in the Snow” for choir, children’s choir and orchestra, was commissioned by the Knoxville Symphony Orchestra and has been performed by the Pittsburgh Symphony and the Naples Philharmonic, She received her BS in Music Education from Bob Jones University where she studied with Dwight Gustafson. She is also the owner of Fountain Park Music Publishing and also lists two works with Wendel Music of New York City. Statement: If Dvorak visited Spillville today, he probably would have taken a Sunday drive to nearby Postville. 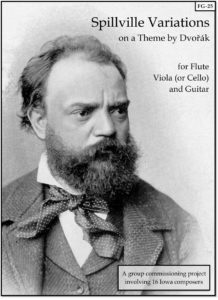 Being the champion of folk music that he is, perhaps Dvorak would have been influenced by Postville’s community of Hasidic Jews and his quartet may have turned out more like this! Eighteen-year-old Luke Gullickson, a native of Cedar Rapids, IA, has been recognized on the state level as a pianist, and as a composer has been acknowledged regionally in contests including the MTNA Composition Competition. He is currently studying music at Illinois Wesleyan University in Bloomington, Illinois. Statement: My variation is a product simply of thinking of the main motives in 4/4 meter and playing with the resulting rhythms. I also tried to diversify the harmonic palate slightly, but the senses of rhythm and interplay are the main focus of the variation. Michael Daugherty grew up playing the keyboard in jazz, rock and funk bands. He studied at North Texas State University at the Manhattan School of Music, and at Yale University (DMA 1986). He is Professor of Composition at the University of Michigan. His work Snap! — Blue Like an Orange won a Kennedy Center Friedheim Award in 1989. Statement: My variation is titled Crystal. While in Iowa, I imagine Dvorak gazing into a crystal ball and longing for his Czechoslovakian homeland. Donald J. Chamberlain is a composer and guitarist living in Mt. Vernon, Iowa. Statement: As Beethoven shows us in the Diabelli Variations, many aspects of a theme are fair game for variation. In my contribution, I chose to focus on meter and texture. Peter Bloesch was trained in classical music from a young age, including studies in composition, cello and piano. In 1990 he moved to Los Angeles to study film scoring and became active in the Hollywood music scene. In 1994, he returned to his native Iowa where he continues to write music for films, as well as concert pieces for orchestras and chamber ensembles. Statement: Two fugal techniques, stretto and inversion, went into this fairly strict fugue (a la Baroque). However, the variation still has many “Hollywood” elements and harmonies. I really enjoy trying to fuse together a sense of strict “fugality” with a sense of playfulness, harmonic freedom, and Hollywood drama. I think it’s an attempt, psychologically, to try to reconcile my two “worlds” into a cohesive whole — my pre-Hollywood strictly classical upbringing and my “pull-out-all-the-stops” Hollywood training. Dan Knight is a protégé of jazz pianist Billy Taylor and classical pianist Tillie Maither (a student of Paderewski). Steinway Artist Dan Knight has been called “one of the finest solo pianists in the world.” His works extend the boundaries of style in a fusion of “classical” form, jazz, and free improvisation. Statement: This piece is like a quiet intimate conversation between the closest of friends. Harvey Sollberger, award-winning composer, conductor & flutist, is on the faculty of the University of CA, San Diego and Director of the La Jolla Symphony. He is a leader of ensembles including the Manhattan School of Music Contemporary Ensemble, the Indiana New Music Ensemble and UCSD’s Sonor. Statement: Dvorak’s fascination with nature, and especially the new and strange birdcalls he encountered in Spillville were the motivation for my variation. On another level I feel especially close – in an almost mystical way – to Dvorak’s Turkey River sojourn. Just a year before Dvorak’s visit, my 20-year-old grandfather, Fritz Dennler, emigrated from Switzerland to Elgin, Iowa, a few miles downstream from Spillville. In a way I can’t explain, his and Dvorak’s being “neighbors” brings Dvorak closer to me: Dvorak is MY neighbor. Pat Smith is a guitar player living in Santa Clara, CA. He has played in many styles over his thirty years in music and is currently the guitarist in the Brazilian band Nossa Bossa. He also played with the Penguin Jazz Quartet, recording two CDs which included several of his jazz tunes. He always wonders why he has to speak of himself in the third person in bios. He is a graduate of Cornell College in Mt Vernon, IA. Statement: I love Jazz and Blues, so I used a B minor blues form for my variation. Jerry M. Owen (b.1944) was composer-in-residence (2002-05) with Red Cedar Chamber Music and is Professor at Coe College. His flute/guitar music includes Hidden Tango (Presser), Meshquanowat (Acoma Music), and with viola Trio Concertante over Czech Folk Songs and Gypsy Inspirations (www.public.coe.edu/~jowen). come before, rather like the end of an operatic act or the end of the opera itself. Andrew Earle Simpson (b. 1967) was composer-in-residence (2005-2008) with Red Cedar Chamber Music and is Professor of Music at The Catholic University of America in Washington, DC. Statement: This variation, with the performance direction Joyful, Steady Groove, subjects Dvo?ák’s material to a surging, folk-rock-based treatment. Very rhythmically vital, the movement progresses as a small perpetual-motion piece. Building to a climactic arrival with vocal-like pitch bends, the music dissolves quietly until a final punctuation. Joshua Reznicow (b.1975) is Director of Orchestral Activities for the Linn-Mar Community School District in Marion, IA and adjunct faculty at Coe College. He is a member of the Iowa Composers Forum.